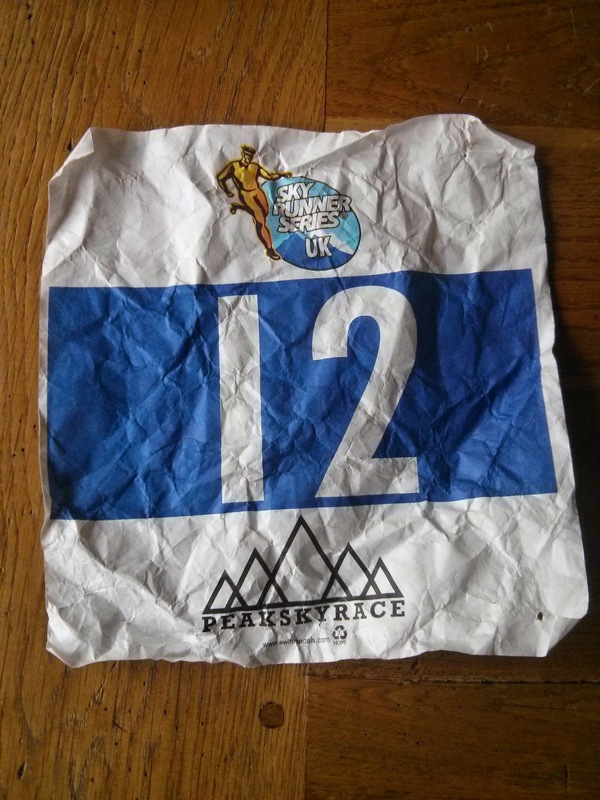 The Peak Skyrace was a masterpiece of route planning, 29 miles of White Peak hills and trails, hardly a flat section and near perfect running conditions. The race began on the edge of Buxton with a warm up across a field, then immediately up to Solomon's Tower. On the way up I thought I was imagining the sound of a piper, but as I reached the summit and the volume increased, the sounds of the bagpipes became apparent. Quite a surprise just after 8am on the first mile of this ultramarathon! The route would its way immediately back down through Buxton Country Park to one of the short road sections out of town, followed by a long drag uphill (the theme for this run was set early). We were soon out on the moorland, onto Axe Edge Moor. I was feeling good and kept a steady pace, not even noticing my new Inov-8 race vest. It made a change to be carrying a litre of water on my front instead of two on my back, but it worked well. Rolling hills followed until the first self-clip point, easily spotted. The course was marked with yellow and black tape, which I could almost have followed without my phone (with GPS and ViewRanger) as backup, but not quite. Much of the first 11 miles has already merged into one long series of hills, a day later. At the first refuelling stop at Newstone Farm I took on another 500ml of water (having drunk less than a litre to here), otherwise not stopping. It took me a while to catch my breath after the malt loaf and peanuts from the checkpoint, eaten heading uphill onto the wonderful Ramshaw Rocks. I was soon enjoying myself again on a long descent before immediately climbing to Hen Cloud at another self-clip point. A brutal climb through the trees here left me struggling, followed by another short descent and straight back up to The Roaches, where I was frustrated to be passed by a couple of other runners. The long ridge run along The Roaches was harder than I'd imagined - rocky and twisty underfoot and still slightly uphill. Once over the summit I had a flying run alongside Lud's Church to another self-clip before doubling back downhill. I caught another runner here, who would turn out to be third lady overall. We chatted on and off, she was better than me ascending and I had the edge downhill. Another welcome water stop by a scout camp at Gradback. Cola, more malt loaf and I was off quickly, regretting the cola as it fizzed about. The next steep climb wasn't so enjoyable on top of food but I soon recovered for the run towards Shutlingsloe - visible in the distance. The climb itself began with a steep road section which I walked, chatting for a bit and then being passed by a couple of other runners. There followed a grim twenty minute ascent on grass and in direct sunshine and this one gets steeper at the top. After the self-clip on the trig-point, it took barely five minutes to return to the bottom, before continuing along a thankfully almost flat section. The beautiful Cumberland Brook followed, a steady climb, rocky and uneven underfoot, hard work, hot and I was running low on water. This turned left into a hidden gully, the sort I have only seen in the Peaks, where you feel hidden from the world. I enjoyed this climb despite the effort required, before it eventually flattened out to reach the last water stop opposite the Cat and Fiddle pub. I grabbed a gel as well as filling both bottles, getting very thirsty now, then quickly crossed the main road with Shining Tor ahead. This was a relatively easy descent and ascent to the self-clip by the trig-point, then turn around. I passed plenty of runners here, which spurred me on to the finish as I knew there were lots of places to be lost if I eased off the pace now. A rough stony descent took me to Goyt's Moss, for a lovely uphill single track through deep bracken. I was feeling good here, legs still strong and wanting to push hard for the finish. The ascent was eventually wearing but I passed one guy who was struggling and there was nobody else in sight behind. Once over the top I recognised from earlier where the inbound route rejoined the outbound, for a flying final couple of kilometres. I enjoyed this downhill despite having to stop occasionally to stretch out calf cramps - so frustrating when so close to the end of a race. I was welcomed into the finish to huge cheers, completing my 65th marathon and my favourite to date! 6:21:11 on the official clock, although they struggled to scan my wrist band at the finish and I actually finished in 6:19:27.